We reckon Malay cuisine is one of the most under-represented cuisines on the world stage. If you’re in Malaysia take the time to venture off the beaten path and seek out some of the dishes mentioned below. You will be blown away by the flavours, variety and sheer deliciousness of Malay cuisine. For details of where to eat these dishes watch the videos below. Head to our YouTube channel and check the description box of the applicable video for restaurant details. Happy eating! Ikan bakar translates to ‘burnt fish’ but what actually awaits you is a BBQ seafood feast like no other. Fresh local fish including squid, barramundi and stingray are wrapped in banana leaves and then basted with a spicy chilli sauce before being cooked on the grill. Smoky, flaky whole fish are served with rice and ulam (fresh vegetables and herbs) to create a mouth watering seafood feast. Masak lemak cili api is a style of cooking that uses coconut milk, chilli, spices and aromatics. The masak lemak gravy is creamy and spicy and poured over various meat. Our favourite way to enjoy masak lemak is with smoked meats and fish. Served with white rice and ulam (fresh vegetables and herbs) this is a Malay favourite. You’ll find that nearly each state in Malaysia has its own version of laksa. The contents of your bowl will vary- you might find wheat noodles in a creamy coconut broth or rice noodles in a spicy, tangy broth. Extra ingredients might include tofu puffs, lettuce, torch ginger flower, chicken or slices of BBQ pork depending on the variation you are eating. One thing’s for sure- it’s bound to be delicious! Nasi campur means mixed rice and it’s one of the best ways to lunch if you’re unsure what you feel like! Load up a plate with a buffet selection of different curries, vegetables dishes, salads, stir fries and crunchy fried treats like fried bergedil (a potato croquette of sorts). This is a style of eating that you will not get sick of! Nasi kukus is a riot of flavour. A mound of freshly steamed white rice is doused in creamy gravies and topped with a piece of golden fried chicken, roasted pineapple and a spicy sambal. The texture and flavours of the dish are varied and you’ll find yourself coming back for more! 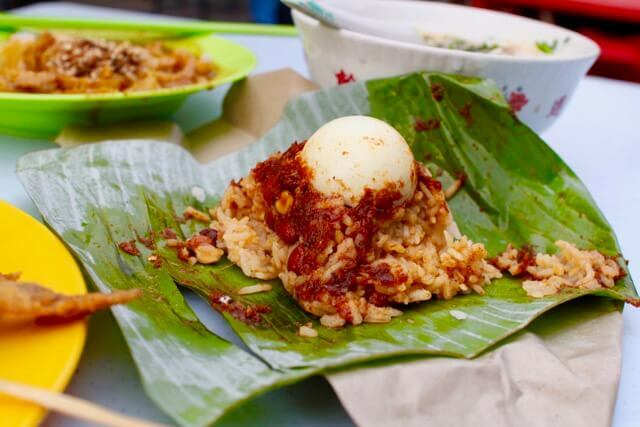 You can’t visit Malaysia and not eat the national dish of nasi lemak! Traditionally a breakfast dish, in reality this classic meal is eaten at all hours of the day. Nasi lemak is made up of rice cooked in coconut milk and pandan leaf, sambal, fried anchovies, boiled egg, peanuts and refreshing cucumber. In its simplest form it’s wrapped up in a banana leaf package otherwise it’s served with side dishes like rendang or fried chicken to create a more substantial meal. This is one dish you do not want to miss! Char Kuey Teow is a popular fried noodle dish in Malaysia. The Malay version of this Chinese dish may lack the addition of pork lard and Chinese pork sausage but it is by no means a slouch in the taste stakes. You’ll find a dry version which is similar to the Chinese version called kuey teow goreng as well as a wet version. Both are cooked in a wok over high heat and use rice noodles, often seafood, sambal, sweet soy and aromatics to create a satisfying plate of fried noodles. Asam pedas is particularly famous in Melaka and Johor. Seafood and sometimes beef is cooked in a sour tamarind gravy with okra and served with white rice, vegetables and half a salted egg. Asam pedas has a great depth of flavour- tangy and a little spicy- we suggest trying it with ikan pari (stingray). For the durian lovers out there, you’ll want to try tempoyak a fermented durian paste which is most famous for being cooked with ikan patin, a freshwater fish. Tempoyak isn’t as pungent as the fruit in its raw form but imparts a beautiful aroma and fruity flavour to the fish. Try this dish with the fish cooked in a tempoyak gravy or bakar style where the fish is grilled and topped with the tempoyak paste. Nasi dagang is a dish that hails from the East coast of Peninsular Malaysia from the states of Terengganu and Kelantan. A mixture of glutinous rice and normal rice is topped with a creamy, spicy gravy cooked with a piece of local tuna and served with toasted, grated coconut and pickled vegetables. The crunch and tanginess of the vegetables and the meaty, flavoursome fish is an addictive pairing. 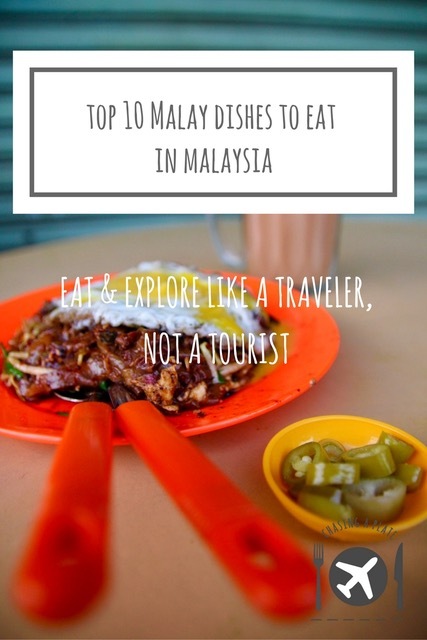 We hope this Malaysia food guide has helped you eat and explore like a traveller, not a tourist! I am really surprised that claypot chicken rice did not make it to the list. It is my personal favourite but agree there is so much great Malaysian food. Been missing these food. And also roti canai and all those delicacies. It’s more than what stated here.